Thanks for visiting my Jersey collection. It's just one of many collections swirling around the internet with all sorts of different jerseys so feel free to check out the links to the right to see what else is out there. I have been playing soccer ever since I was six. My collection began on my 17th birthday when I got my first jersey as a gift; an Eddie Pope US soccer jersey, my once and always favorite American player. During the summer of 2007, my dad came back from Sweden with a national team jersey from that country. Shortly thereafter, while on a mission trip in Bolivia, I picked up a Bolivian national jersey. It wasn't until the next summer when I went back to Bolivia that I picked up my next jersey, A Ronaldo Portugal jersey, and then my club soccer team wore Inter Milan jerseys for out games that summer. By the end of the summer I was headed off to college. It was there in my freshman year in 2009 when my collection began to pick up, partly thanks to honing my Ebay skills. The biggest reason though was probably an awesome RA from Turkey who had quite the passion for the sport (as well as Fenerbahce) and that passion grew on me as well. By the end of the year, I decided I had enough jerseys to wear one for every day of February 2010, so I did. I also began to watch a bit more soccer, but with limited access in the US. That summer saw the South Africa World Cup, and my love of the game and collecting jerseys continued to grow by leaps and bounds. 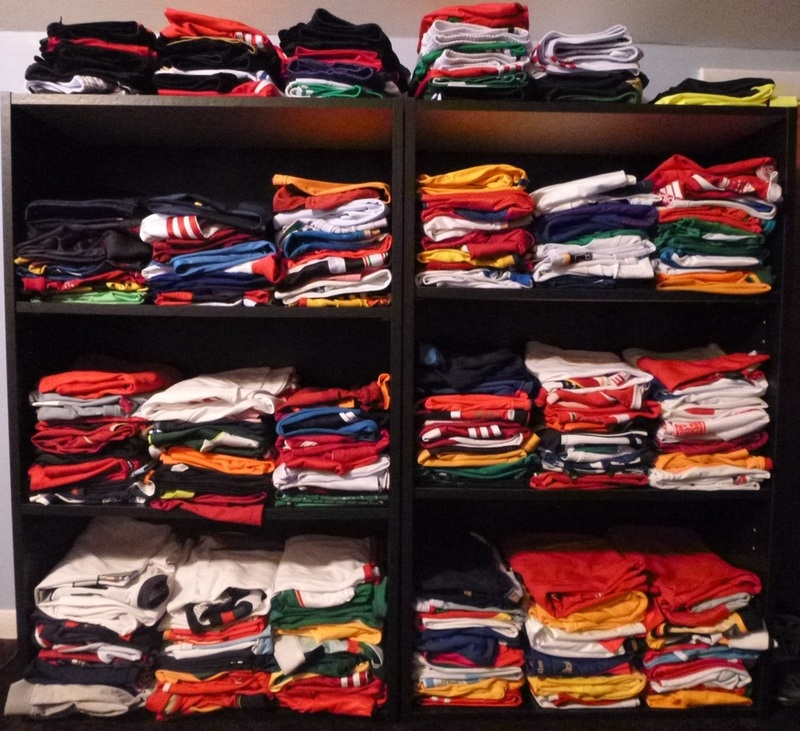 I continued to play and watch as much soccer as I could, and decided to start working towards collecting as many national jerseys as I could, though 209 did and still does seem quite a distant goal. In December 2011 though, I hit my 100th jersey with Tottenham, and through my senior year I wore a jersey practically every day. I Also met a fellow jersey collector from Senegal through playing racquetball of all things, and he introduced me to a trio of brothers who brought pickup from the streets of Bobo Dioulasso in Burkina Faso to the fields of Grove City PA, and I enjoyed the best 6 months of my life with almost daily pickup, and some exciting soccer viewing, especially AFCON 2012. I had quite the African connection that year. Sadly, the pickup would end after I graduated in May 2012, though as you might glean from list below my collection is continuing to expand. I'm grateful to all the people who have supported or shared in my growing collection and love for the Beautiful Game. I know I have a lot of joy from finding and wearing these jerseys everywhere I go, and I hope that this helps others to enjoy them and see how truly global the game is as well. Thanks for stopping by, and don't forget to watch a match or get on a pitch as much as possible! On the Jersey List page is a list of all jerseys I've collected by month and year with a link to that jerseys picture page. At the top are drop down menus with links to jerseys individual picture pages as well as the league pages, international Confederation pages, and a national and club team landing page. On the league and national confederation pages, there are flags and crests that will link to the Wikipedia page for that team, and the written name will again link you to the jersey picture page. There are also links to confederation Wikipedia pages, and league websites and Wikipedia pages. Neville Evans Collection - self declared, "Greatest football shirt collection in the world"
If you have a collection and would like me to add a link here, please contact me by one of the ways at the top of the screen or using the contact form below. Anything missing or want to contact me? Use the form below or find me on Facebook or Twitter at the top of the page.